This Natural Oak tapestry shows the oak tree as the centre of attention. A subtle beige patterned background decorates the piece. The work is in the style of a portiere tapestry with long length and narrow width, to cover walls and chambers to adorn castles and palaces. The oak tree is an important tree in many cultures, and is a symbol of strength and endurance. It is the national tree symbol of many European countries including England, Germany, France, Poland, the US, Wales and Estonia. In Greek mythology, the oak tree was related to the god Zeus. 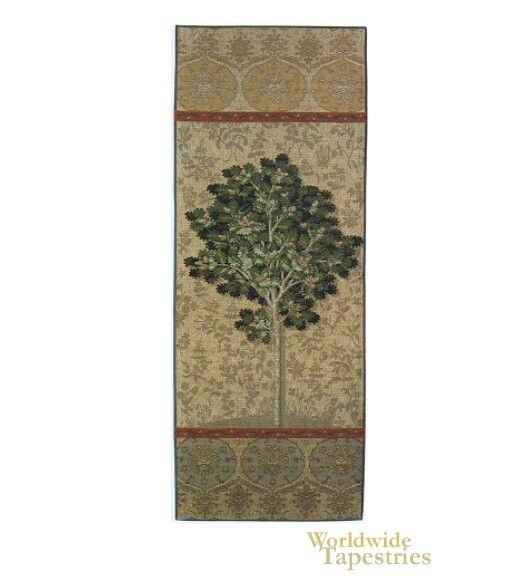 This Natural Oak tapestry is backed with lining and tunnel for easy hanging. Dimensions: W 29" x H 73"